Another day and another Nokia Android rumor. This time we have update from CamSpeed camera benchmark. 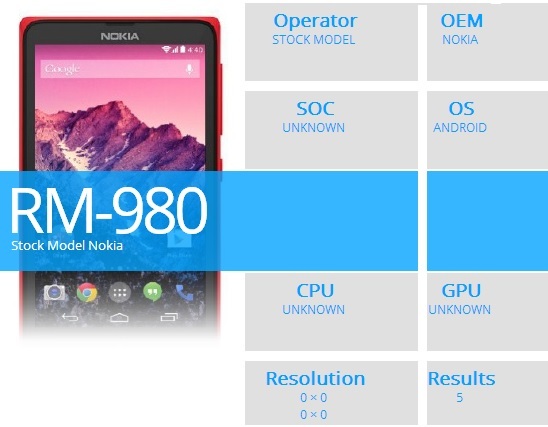 They spotted Nokia RM-980 in their database, which is so called Nokia X (Normandy). The Nokia X that did the benchmark was the dual-SIM version and the detected camera was a 3MP fixed-focus shooter. Rumors until now claimed a 5MP camera, meaning they could be wrong or the single and dual-SIM versions have different cameras. A different prototype module can also create some confusion here too. The Nokia X ran Android 4.1.2, which will be heavily customized by Nokia surely. Earlier we also saw an Android 4.4 KikKat running Nokia X too! Other specs for the phone include a 4" WVGA screen, dual-core 1.2GHz processor, 4GB storage and a microSD card slot. Unfortunately, there's no info on what kind of video the camera will record. The phone is supposed to launch as an Asha device in March. And we are also sure that the phone will look like an Asha phone.